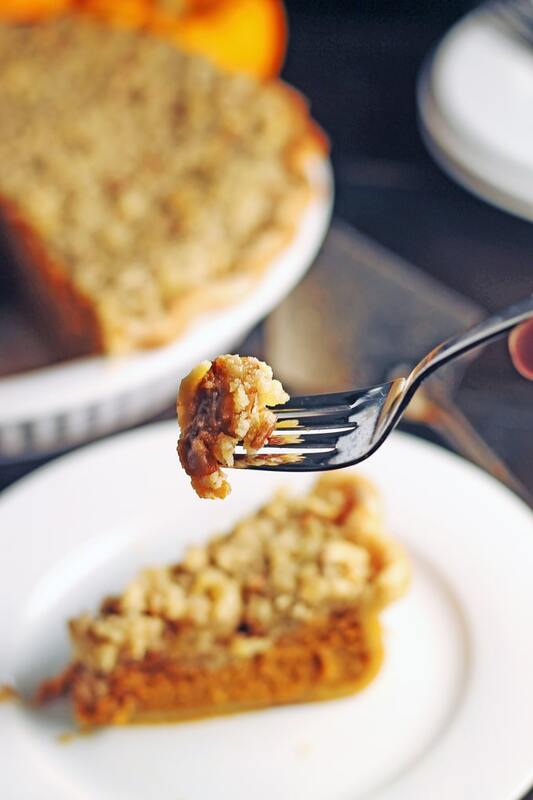 This dairy free pumpkin pie is perfectly spiced and absolutely delicious with coconut cream instead of dairy cream and is topped with a crunchy streusel topping with pecans and crystallized ginger. 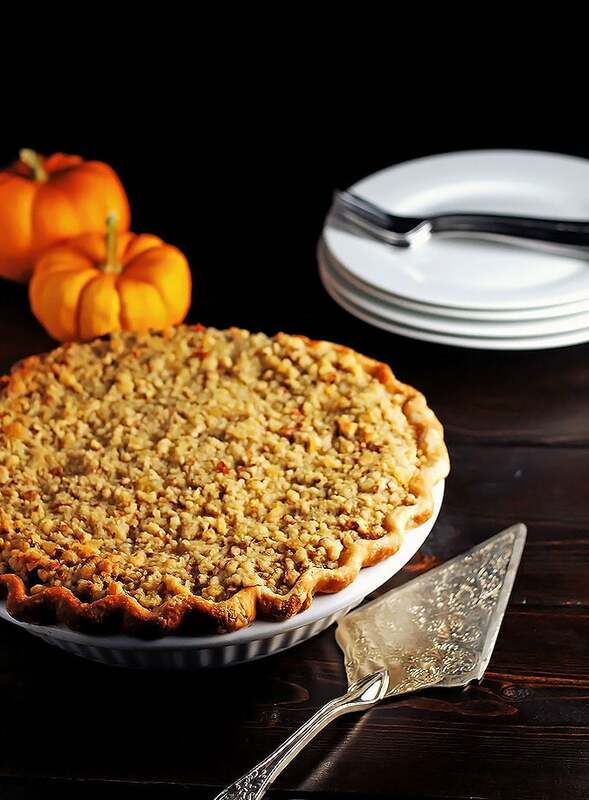 There nothing more thanksgiving than pumpkin pie, except maybe the turkey itself. Its actually become a symbol of fall and no thanksgiving dinner is complete without one. I have to admit, I never really liked pumpkin pie until I first tried my grandma Pat’s. Shes an excellent cook and makes a fantastic pumpkin pie. I tried my hand at making dairy free pumpkin pie a few years ago and I have never looked back. Its just as good as my grandmas original and being dairy free means that I can enjoy it without any of the negative side effects I often get from dairy. Coconut cream makes this dairy free pumpkin pie so smooth and creamy and doesn’t taste like coconut at all. All the spices and the pumpkin take care of any coconut flavor it might have. You can buy coconut cream by itself sometimes, but if you cant buy it, you can leave a can of full fat coconut milk in the fridge overnight and then open it without shaking. The cream will all be at the top and you can scoop it out easy. 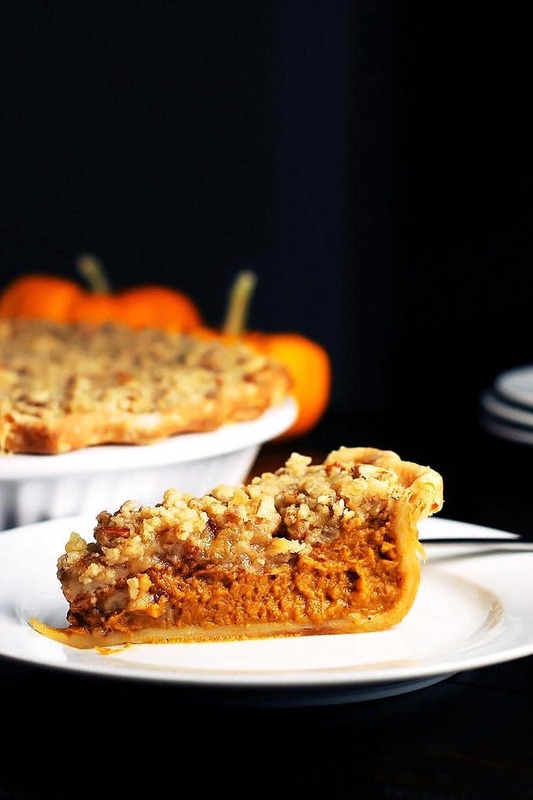 This dairy free pumpkin pie has a silky, smooth, melt-in-your-mouth pumpkin filling flavored with lots of yummy spices and topped with a pecan streusel topping. If you like, serve it with whipped coconut cream, or whipped or ice cream for those not dairy intolerant but its very very good just on its own. Everyone loved it and I think this pie was probably my best pumpkin pie ever! Not everyone is a fan of the streusel topping so if you arent, just leave that part off. Both Debbie and I love that part! Be sure to check out our favorite tried and true thanksgiving recipes to go with your dessert: juicy brined turkey with stuffing sausage, fall apart boiled ham, cranberry turkey wellingtons, sweet potato stacks, garlic potatoes with dill, and our favorite layered salad. I look forward to thanksgiving every year. Not just for the amazing dinner that Debbie always hosts, but mostly because our family always gets together for it. My mom Joan and her man Alf, Mark and Debbie, my Grandma Pat (and my Grandpa Pete when he was alive), Marks parents, Moe and Judy, my brother Matt, and sister Sam, and Kevin, Jess, sometimes Dallen when we can have him there, and I. Also, Kevins parents Gail and Casey and Grandparents Joan and Less have joined us once or twice too. I LOVE it when everyone is there. I know it seems a little cliche, but I am truly thankful for my family. You cant choose your family, but I couldnt have chosen a better one anyways. Both my extended family and the little blended family that Kevin and I have together, although I did choose that one ;). Both Debbie and I are also lucky enough to have a number of friends that I consider family as well. I think true happiness has a lot to do with the relationships that we have with the people around us. I feel truly blessed writing this right now and thinking about all the wonderful people that I have in my life! In the spirit of being thankful, I am also grateful for all of you that come to our site and read this blog. 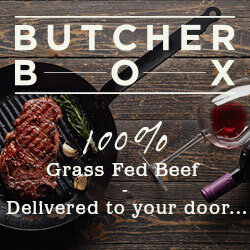 Without you, there would really be no point in doing this and Debbie and I both love getting together and creating recipes and cocktails to share with you all. 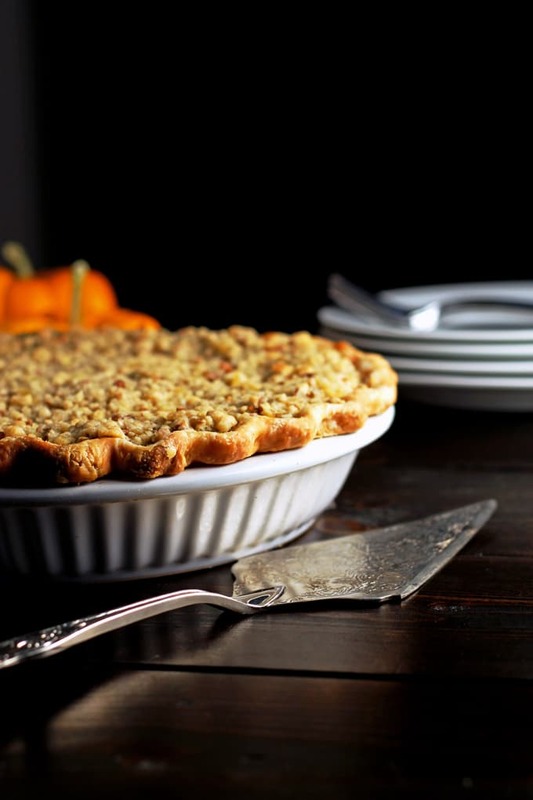 We hope you enjoy this dairy free pumpkin pie with all the people that you love! In a small bowl, add the egg and break it up with a fork. Add the vinegar and the cold water. Set it in the fridge till you are ready for it to keep it cold. In a bowl or your mixer, add the dry ingredients. Then add the cold butter. Pulse in your mixer till it resembles small peas, or break up with a pastry cutter by hand. Add the liquid slowly and mix till just combined. Pour out on to a surface and mold into a ball. Wrap it in plastic wrap and place in the fridge for at least 1/2 an hour. 1 hour is better. After an hour, roll out the pie crust so that it fits a 9 inch pie plate. Leave a little around the edges so that you can pinch them and make the edges look pretty 🙂 Put the pie crust in the fridge till the filling is ready. Mix together the dry ingredients (sugar and spices) in a bowl. Next add the eggs, pumpkin, and coconut cream. Mix well and pour into the pie crust. Bake pie for 15 mins to start, then cover with tinfoil to stop the edges from turning too brown. Bake for another 25 mins. In the meantime, make the streusel topping. Mix all the ingredients in a bowl and cut the butter in with a pastry cutter till it resembles coarse peas. 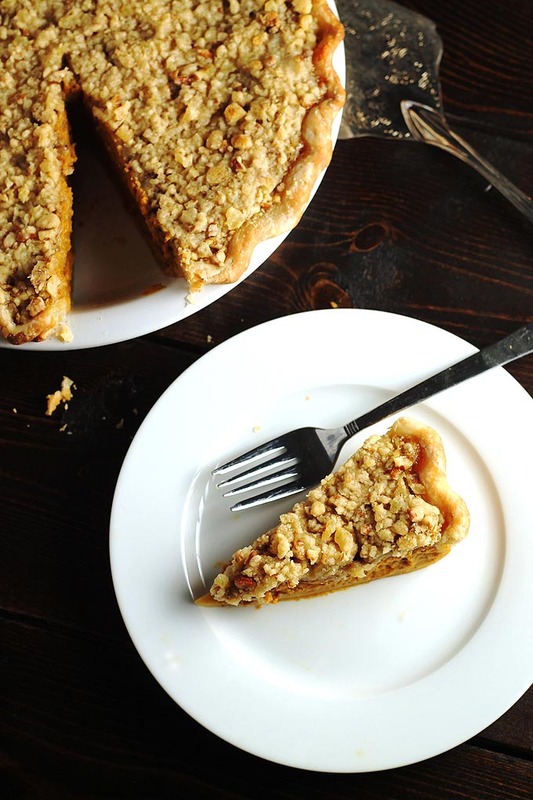 After the second bake time, take the pie out and cover with the streusel topping. Bake for another 20 mins, but make sure to keep the tin foil on to protect the edges. Remove from the oven and allow it to cool completely before serving. Smash Burger Sliders ~ Superbowl Party Food!